Radical lines is your top destination for ziplining and aerial challenges. 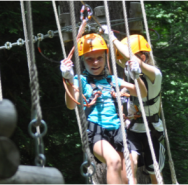 Challenge yourself, your family, even your co-workers, to a treetop excursion that tests your strength, agility, and courage in a safe and fun environment. Radical lines provides the highest quality experience perfect for all thrill seekers and adventurers. Visit our website for rules and pricing.